Cig is a sea turtle that looks rather cute until you take a closer look to see what he’s actually made of—1,200 repulsive cigarette butts. 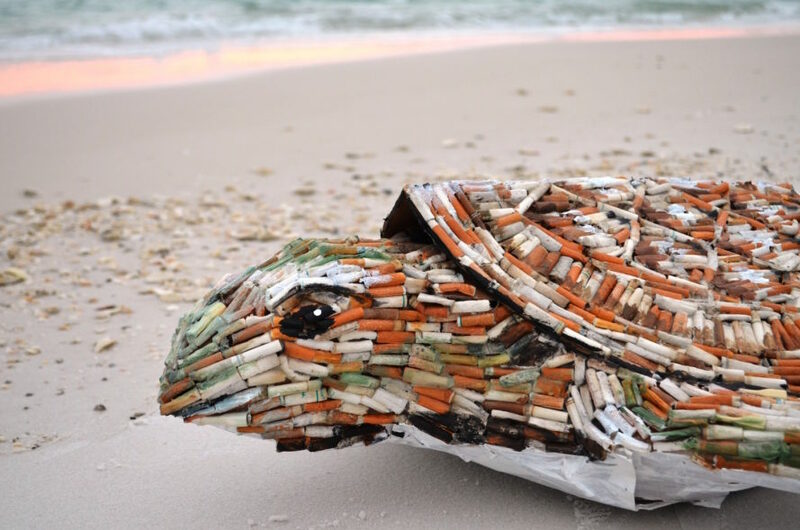 The striking trash-inspired sculpture is the work of Shelly Marshall, a self-taught artist and founder of SHELLart, who uses art to spread the message about the threats facing marine life and ecosystems. 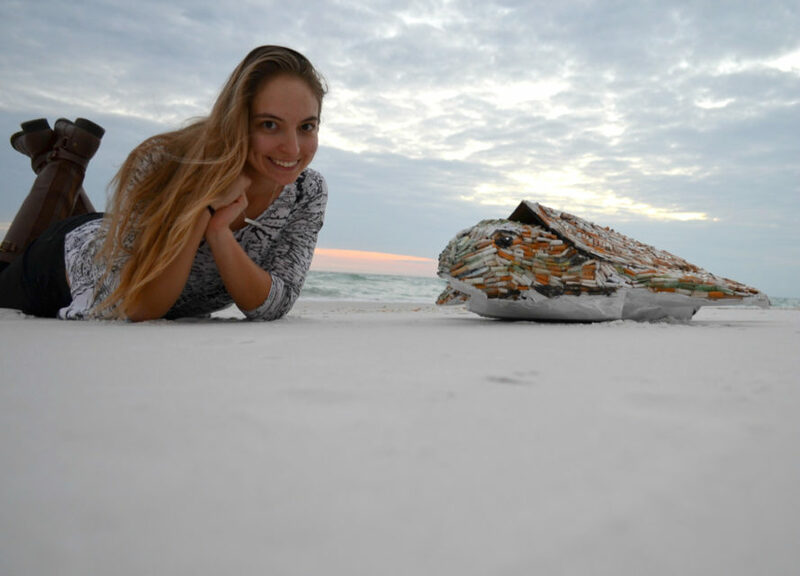 Together with Ocean Hour volunteers, she spent less than an hour collecting over a thousand cigarette butts strewn across Florida’s Pensacola Beach and rearranged the tiny bits of trash to create Cig the sea turtle and bring awareness to the impact of littering. Although litter control laws and public service announcements on recycling have made big impacts on the way society deals with trash, the same can’t really be said about cigarette butts. Ocean Hour, the Pensacola-based marine debris committee that stages local cleanups at the beach every Saturday, found that cigarette butts were always one of the top three local pollutants year after year. Thus, Shelly was inspired to make an art piece that would communicate the anti-litter message in a more eye-catching way. 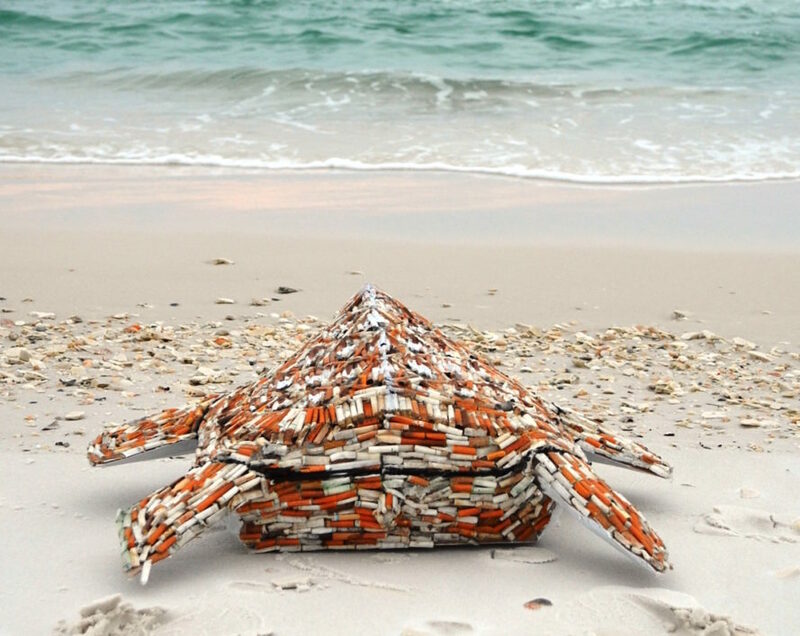 Cig the sea turtle was made from a lightweight cardboard base and covered with roughly 1,200 cigarette butts attached using clear glue. The glue, Shelly adds, helped to cover up some of the smell from the trash. The artist is working with Ocean Hour to collect different kinds of trash in hopes of creating a series of marine sculptures made from commonly found debris. Her next artwork will be a bottlenose dolphin constructed of reclaimed plastic bottles. Cig will be on display at the Navarre Beach Sea Turtle Center for the month of February. Ocean Hour, the Pensacola-based marine debris committee that stages local cleanups at the beach every Saturday, found that cigarette butts were always one of the top three local pollutants year after year. Cig the sea turtle was made from a lightweight cardboard base and covered with roughly 1,200 cigarette butts attached using clear glue. The glue, Shelly adds, helped to cover up some of the smell from the trash. The artist is working with Ocean Hour to collect different kinds of trash in hopes of creating a series of marine sculptures made from commonly found debris. Her next artwork will be a bottlenose dolphin constructed of reclaimed plastic bottles. Cig will be on display at the Navarre Beach Sea Turtle Center for the month of February.